Help me take this mask off… | Kris Johnson's Blog…sort of. 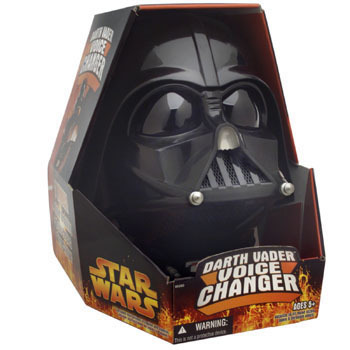 Having spent nearly 25 years on your planet, one might expect me to have outgrown such things as the Darth Vader Voice Changer Mask. One would be quite mistaken, for the mask can be adjusted to fit even my enormous skull, a fact I was delighted to learn when Miscellaneous G™ presented the mask to me as a gift yesterday. I can even, with a bit of careful maneuvering, fit the mask over my glasses. This is a good thing, as I have no desire to get contacts again. I look like a dork in contacts. Like the link says, No Comment.